Skimmers on ATM and gas pumps have been a problem for years, but thieves are becoming more sophisticated with the skimming devices they use and how they hide them on machines, making them virtually invisible in some cases. 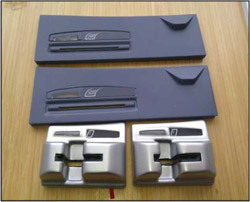 Our Broadview Heights ATM was recently targeted with one of these skimming devices. We take many precautions to ensure our machines are safe to use, including video footage and inspecting the machines each business day and continuously educating our teammates on skimming theft. However, thieves can still target nearly any ATM, and many banks have fallen victim to their scams. 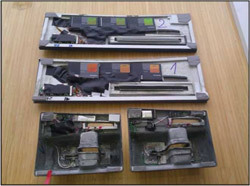 Skimmers can be anything from a thin metal strip that’s inserted into the card slot, to a faceplate that fits over and completely covers the card slot in an effort to camouflage the device. When a card is inserted, the skimmer records the card’s data, and a camera hidden in a brochure holder, security mirror, decorative plate, or something else records the PIN. Many of these devices can transmit the stolen data wirelessly, so scammers don’t need to return to the location to retrieve the device. Your card information and PIN could be used almost as soon as you leave the rigged machine. So, what can you do to avoid them? 1. 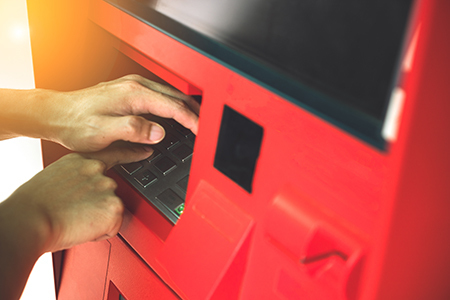 Inspect every ATM before use: You’ll want to check card sliders at gas stations, parking lots/garages and anywhere else, especially if you’re using your debit card. If the scanner does not match the color and style of the machine, it might be a skimmer. You should also “shake” the card scanner to see if it feels like there’s something attached to the card reader on the ATM. Peek inside the card slot to look for anything that might not belong. What looks like a “shiny metal plate” is all that needs to be in there to get your data. 2. Cover the keypad when entering your PIN: In order to access your bank accounts, thieves need to have your card number and your PIN. By covering the keypad, you prevent cameras and onlookers from seeing your PIN. Thieves often replace decorative plates, brochure holders, and other parts with their own and rig them with cameras to get your PIN. Look for pieces that seem out of place or don’t match rest of the machine, and watch for small pinholes that may have a camera on the other side. 3. Check your bank and credit card statements often: Be vigilant and check your transactions often. Sign up for online banking, e-alerts, and our mobile app so you can easily monitor your account and keep track of any and all transactions. All three of these can help you stay ahead of any fraudulent activity on your account. 4. Be cautious about the machines you use: General ATMs at bars or restaurants are not usually monitored and therefore, can be easily tampered with by anyone. Plus, there’s a market for old/used ATMs and if not taken care of, the information they store can be hijacked. 5. Consider downloading a skimmer detecting app on your smartphone: Search your app store for apps that can detect skimmers. They work by scanning for nearby devices that are transmitting data via bluetooth. But be aware these won’t catch every skimmer, some may still use remote data that a thief has to retrieve via a SD card. Members who may have been affected by skimmer fraud at our ATM are being contacted and our teammates will be working closely with them to ensure their accounts are secure and we are working to investigate all transactions on the accounts affected. If you have any questions about our policies or your account, please contact us. If you are concerned you’ve been a victim of fraud, please contact us immediately.